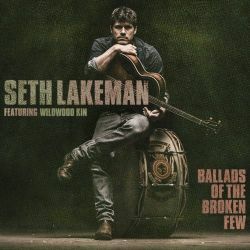 One of the stars of the folk scene, Seth Lakeman remains for many synonymous with thumping beats, high volume and a driving, pin your ears back sound that lacks subtlety. But this is to do him a grave injustice. He may not be an obvious innovator like Jim Moray or possess as broad a brush as the one that Jon Boden wields but he is an explorer, a treader of paths that, if not exactly untrodden, are certainly not ruts. His eighth album features the Devon female trio Wildwood Kin and the sound the quartet have created is bare bones, stripped back and sounds as much like Americana as anything that could be classed as folk. Lakeman’s vocals are front and centre, the Kin provide great harmonies and backing and the overall effect is both powerful and hypnotic. There’s more than a hint of gospel on a few tracks and even on something like “Innocent Child”, which is nearer “standard” Lakeman than the rest there’s still a haunting, slightly disturbing overtone. It’s not hard to imagine hearing this music somewhere in the Appalachians, echoing through the trees in a dark, dank and slightly feral forest. There’s little stylistic variation across the eleven tracks but Lakeman does it so well it’s hard to complain. Indeed it’s hard to complain about anything to do with this album. It will probably surprise a few people but something of this power and heft ought to end up in more than a few year-end “Best Of” lists.